HEARTY CHICKEN WITH GREEN CORIANDER RICE AND VEGETABLES. As soon as I opened my eyes this morning, I felt a sudden craving for Arroz con Pollo. Every time I was out of the country on holidays with my family, the first lunch we had, back in Peru, was Causa and Arroz con Pollo. There is something satisfying and comforting about it that makes us feel at home. 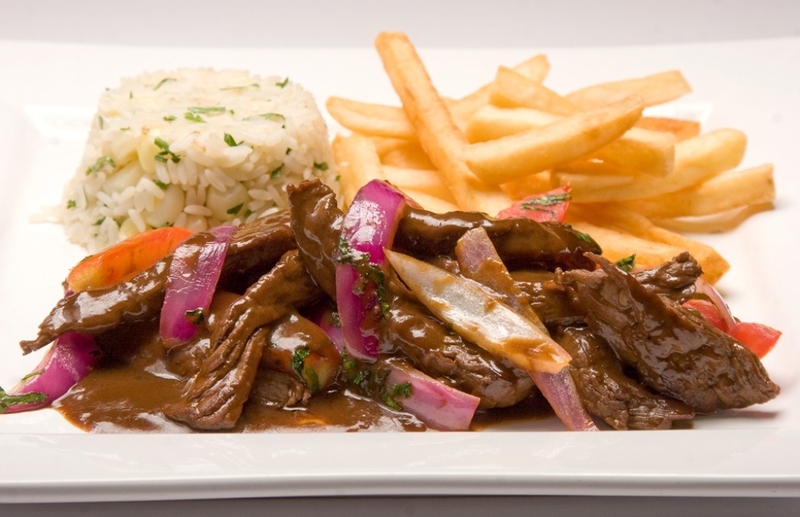 Peruvians are extremely fond of rice in general. We have many rice dishes, and this cereal is the most popular garnish along with potatoes, standing at the side of every dish. We love it! Arroz con Pollo is one of our all-time favorite rice dishes. It´s enjoyed freshly made or after a few days in the fridge, with or without chicken, with Salsa Criolla, Salsa Huancai­na, or a fried egg on top, or any possible way really. 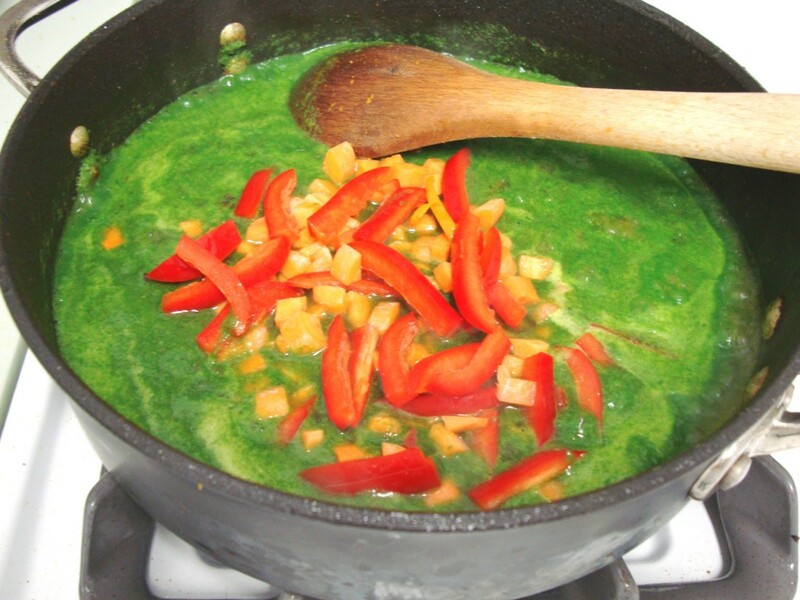 The dish is colored green with the cilantro, but there are versions in other parts of the country that have different colors: red (with aji panca or achiote) yellow (with native saffron from the North of Peru), or almost white. I like mine very green because I love cilantro, but in cooking school I learned to combine cilantro with spinach leaves to enhance the color. It works. 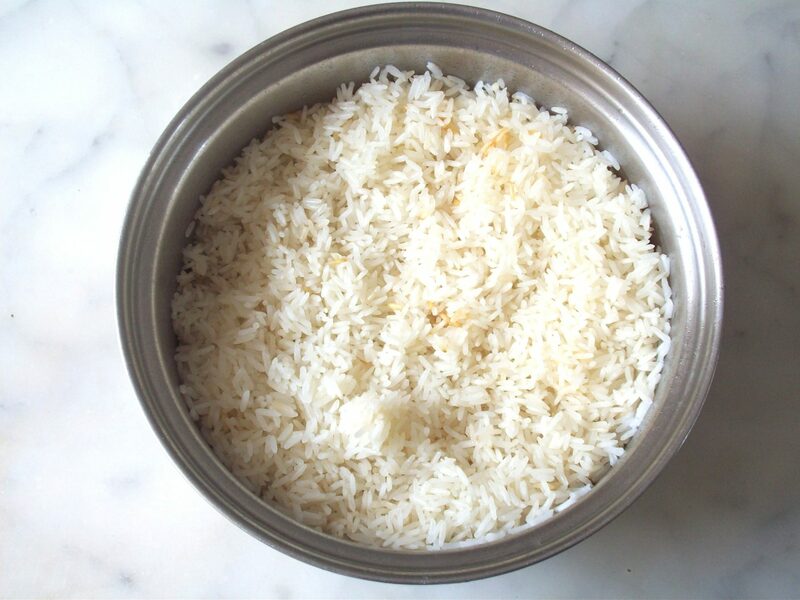 I also learned to cook the rice alone, instead of cooking it in the green stock along with the chicken and vegetables, and have been preparing it this way since then. However, it is a matter of personal taste, and whatever you choose its amazing taste is guaranteed. Beer is optional, and even though I am not a beer drinker, I think that it gives the dish a depth of flavor that is very appealing. Of course, you can substitute with white wine or Chicha de Jora, if you find it in Latino supermarkets. Otherwise, go with beer or use only chicken stock. Many years ago, I started to cook with skinless chicken, mainly for health reasons but specially because my picky children hated the skin, but in order to have succulent and moist meat, it is a good idea to leave the skin on. You can remove it later if you want. Here you have the recipe for a classic Arroz con Pollo. 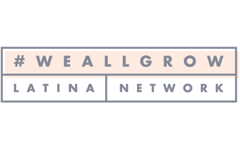 Enjoy it, and stay tuned for new and exciting recipes! 1 cup corn (We use Peruvian Giant Corn, which you can find frozen at Latino grocery stores, but you can use any corn). *Cook the rice as usual and reserve. *Process the cilantro and spinach leaves in a blender with 2 tablespoons water. Reserve. *Season the chicken with salt and pepper. 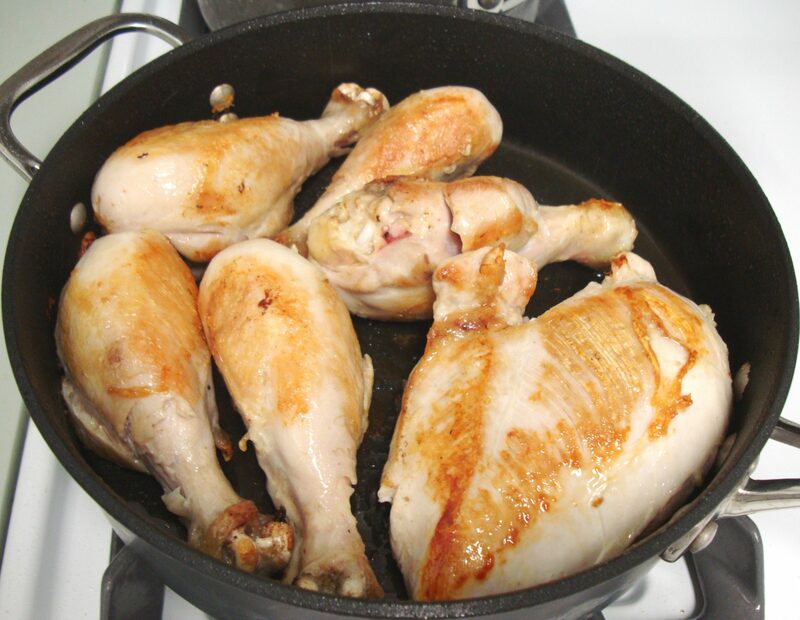 Heat the oil in a saucepan over high heat, add the chicken, and cook until it has a beautiful golden color, 15 minutes. Transfer to a plate, cover and reserve. *In the same pan saute the onion, garlic and Aji­ Amarillo, stirring for 5 minutes over medium heat. Add the cilantro and spinach leaves mixture, beer, chicken stock, and the chicken pieces. *Cook 15 minutes, season with salt and pepper, cover and cook for 10 minutes longer. 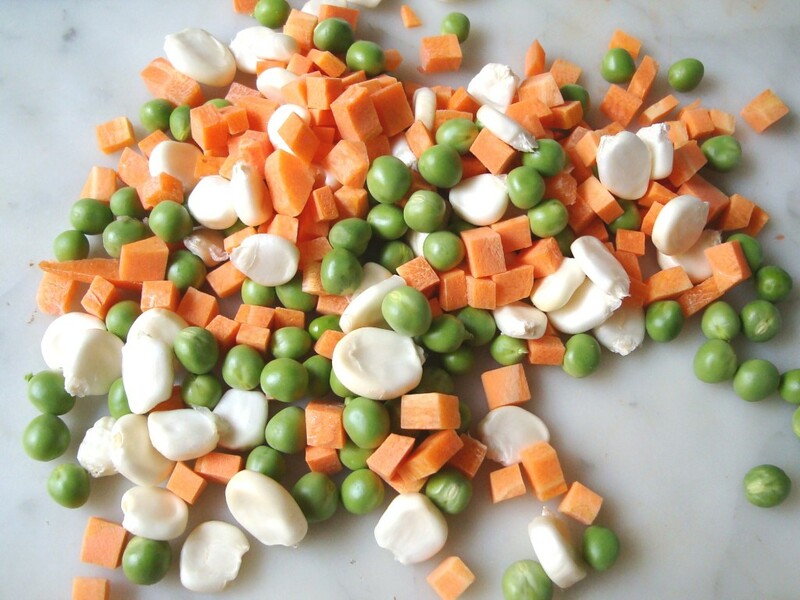 Add green peas, carrots, red bell pepper, corn, and cook 10 more minutes. *Add rice, stir very well, and serve with Salsa Criolla. Our children were born in Peru and we lived there for several years. That is so sweet, Anne. Where do you live now? Maybe some day you want to come to visit us again. Thank you so much for this recipe! 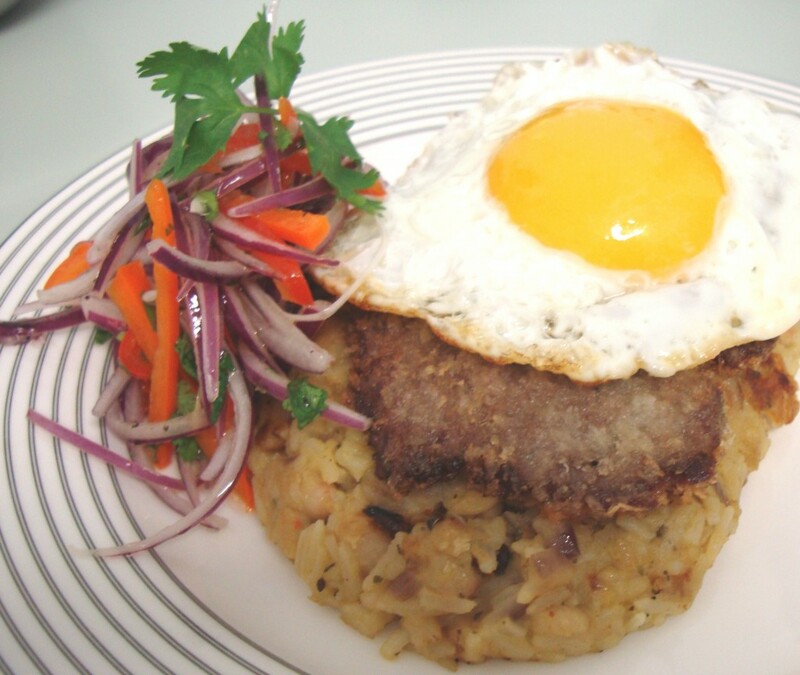 My fiance is Peruvian and I surprised him with this dish, exactly as you wrote it and he loved it! He said it’s better than in most restaurants! I’m getting pretty good at following Peruvian recipes now, thanks to people like you who help me keep my confidence up with a fantastic product! Thanks again! Great to hear that, Alexandria! We are happy that you and your fiance like arroz con pollo. Thanks for visiting and for letting us know about the recipe. 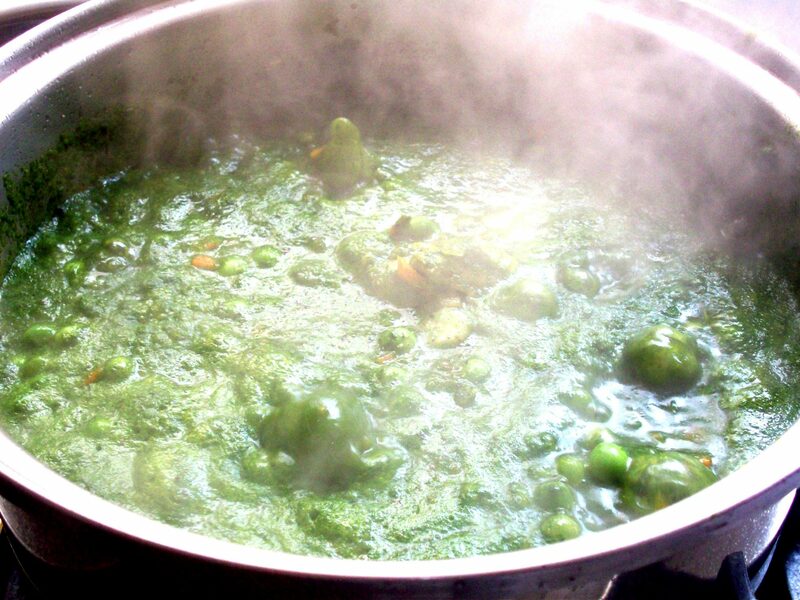 Hello I’m confused as to your recipe ,you said 4 spinach leaves? And 3/4 cup cilantro? Sounds like typo could you. Correct for me if it is? Yes, Stephen. We use 3/4 cup cilantro leaves and 4 spinach leaves, just for the color. 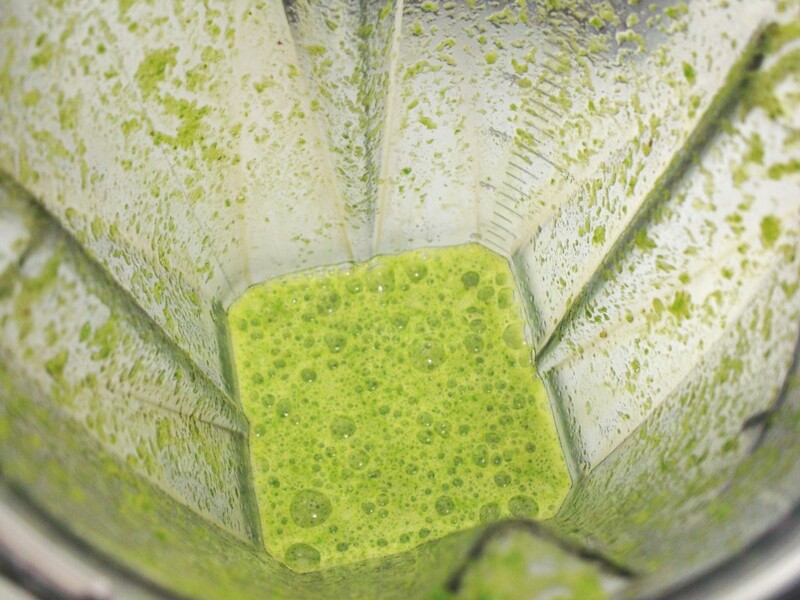 You can use more if you want but you don´t want to mask the cilantro flavor in the recipe. Hi Julie! It´s fine to use jarred aji paste in this recipe. Taste it first to know if it´s mild or very hot. Then add a tablespoon at a time to the aderezo. 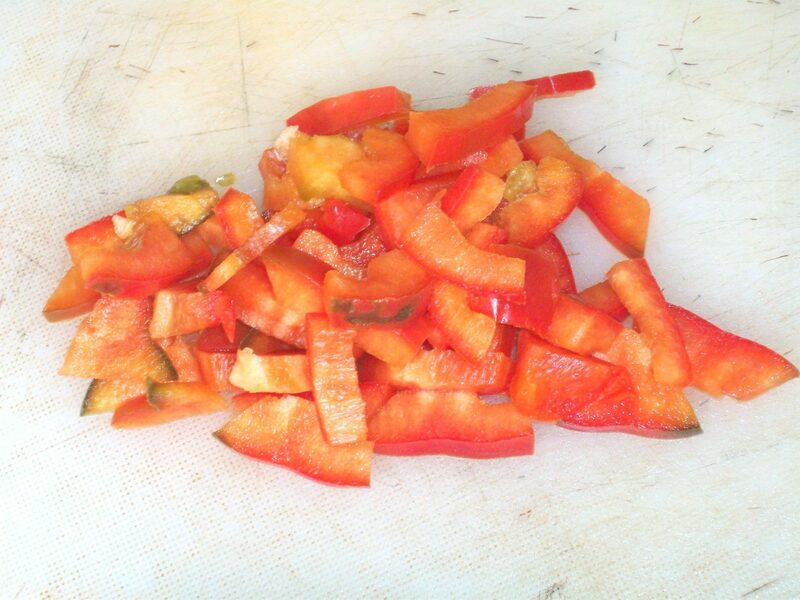 If you like spicy food you may add a good amount; if you want only a little kick, one or two tablespoons will be good. I made this and the flavor was perfect. My only concern and i would like to improve next time is the rice. It came out too “mushy” and I don’t know how to prevent that. Please advise. 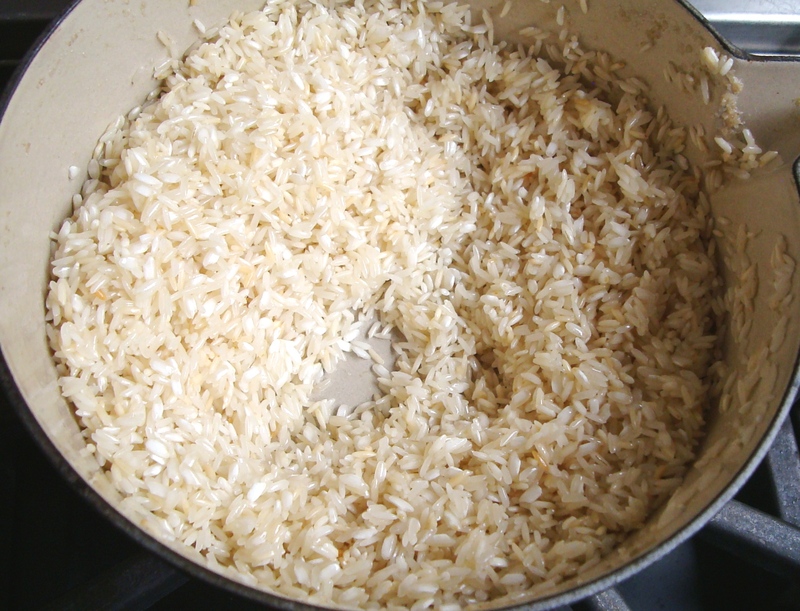 Don’t add too much liquid to the rice. For the cilantro paste, you indicate add 4 spinach leaves (I’ve seen that in other recipes too). Really? Just 4 leaves? If so little, what is the point of the spinach leaves? We add them to make a greener paste but you can leave them out of the recipe if you want. thanks for cooking with our recipes, Couch Cuisine! 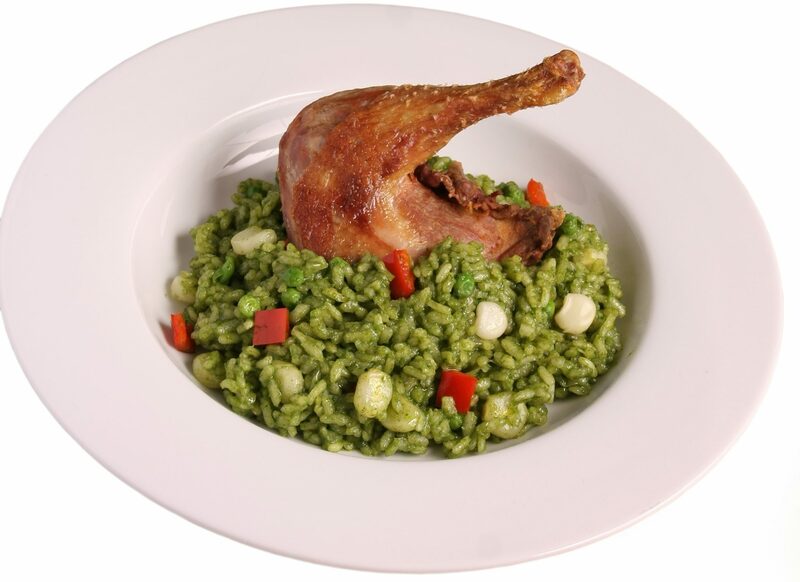 What makes Arroz con Pollo a Peruvian dish is the use of cilantro and ají, but we also have other variations of the same dish with different colors. Glad you liked it.